Bike Balance Dog Jogger Kit | Springer Jogger Versus The Competition! Springer Jogger Versus The Competition! If you you are on this page, you would probably love to go out for a bike ride with your dog? Letting your pooch run alongside you while holding the dog leash can be very dangerous if done wrong. By holding the leash in your hand, you are effectively limiting your steering to only one hand. And by holding the leash in your hand, it’s quite possible that your dog will get excited, run away and slip out of your grip. 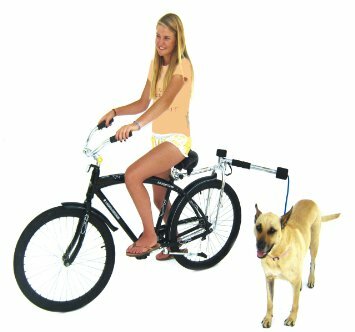 Riding a bicycle with your dog couldn’t be easier now that the Bike Balance Dog Jogger Kit is here. The manufacturer claims that it is the ultimate bike dog leash, and based on our experience and many other reviews we can say that it certainly lives up to this claim. We’d like to tell you a little bit more about why the Bike Balance Dog Jogger Kit is the top-of-the-line in bike dog leashes. I know a couple of dog owners who love this product. For me personally, the jury is still out. If you’re ready, and don’t want to just take my word for it, please click here to find out even more about this awesome bike leash and it’s competitors Go Here. Why Is the Bike Balance Dog Jogger Kit Considered the Ultimate Bike Dog Leash? • Safety is a top priority – as mentioned, it’s much safer using a bike dog leash than it is to ride around with your dog’s leash in your hand. And as far as bike dog leashes go, this is definitely the safest because of its ability to give your dog the freedom to roam in all directions. Your dog can jog on the left side of you, jog behind you or jog on the right side of you. This freedom of movement is wonderful for your dog and it is perfect in case your pooch needs to scoot out of the way of other bikers or pedestrians that might be blocking his or her path. • Easy to assemble – once you’ve taken the dog jogger kit out of the box, you’ll immediately realize that it is very simple to assemble. Some people worry that assembly will be difficult at best and impossible at worst, but nothing could be further from the truth in regards to the Bike Balance Dog Jogger Kit. Although some have complained that the directions could be clearer, in our opinion it was very easy to put together and very easy to attach to the back of a bicycle. • Excellent price for the value – when comparing the Bike Balance Dog Jogger Kit to other bike dog leashes of this kind, this is a low-cost leash that you and your dog will certainly enjoy. Many other bike dog leashes are similar in price but have mixed reviews. This product has fantastic reviews and costs about the same amount of money. So it’s valuable and worthy of your hard-earned money. It is certainly less expensive than the Springer Bicycle Jogger Found Here. • If you have a larger dog, you may want to step up your setup by adding the Extreme Replacement Leash. Are you ready to take your pup for a jog? Click here to learn even more information about the Bike Balance Dog Jogger Kit.